A few weeks ago, Belgiuminabox visited one of Belgium’s smaller breweries: ‘Dilewyns’. Most famous for their respected line of beers under the name of ‘Vicaris’, but also providing some specials for export & occasions. 5 years have gone by since this brewery started out brewing in their current location – Dendermonde. The beers itself have been around since 10 years. This anniversary called for a beer, and thus Lustrum was born! After a nice visit to this friendly brewery, we got to purchase some of these to give our customers the chance to taste this unique beer. Additionally, Belgiuminabox had the opportunity to purchase the very last of the rare ‘Special Edition Generaal’ which is their dark beer with added lactic sourness. The best news? 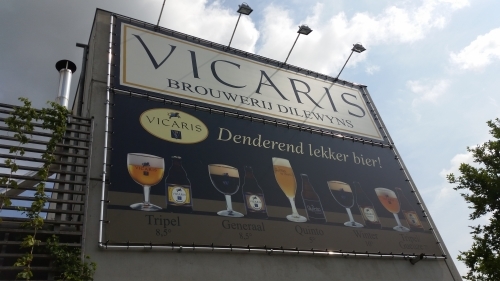 The Brewery Collection : Dilewyns (Vicaris) is priced at only 65€ for the complete package! Author KurtPosted on September 21, 2015 September 23, 2015 Categories Belgian Beer, Belgian Glassware, Belgiuminabox Products, News, Other Belgiuminabox TopicsLeave a comment on Belgiuminabox presents Dilewyns ! 10% discount on all Glassware until 30th September! As communicated before we still have a 10% glassware discount on all orders. Since we moved to the new warehouse, we did loads of warehouse cleaning. As an extra celebration, all glassware is currently 10% discounted. This action ends 30th of September 2015.So if you still have some room left and are looking to get some new/proper glassware, Belgiuminabox.com would be the way to go. Author KurtPosted on September 15, 2015 Categories Other Belgiuminabox TopicsLeave a comment on 10% discount on all Glassware until 30th September! The Belgiuminabox warehouse is now open to the public! The past years many foreign customers on a trip through Belgium came to visit the Belgiuminabox warehouse. To grab a beer, make an order or even use the Belgiuminabox shipping service to send all the bottles they bought elsewhere to their homes. Since the visit requests are ever growing, we decided to actually create an ‘Open Warhouse’. In the new Belgiuminabox warehouse we prepared a nice atmosphere to taste beers and allow the customer to roam around. We created an open setting with clear view on all beers, glassware and memorabilia. Those of you who saw how crammed the old warehouse was, will be amazed seeing how spacious our new warehouse actually is, even with more products in stock! All offline orders also get a 10% discount applied! So feel free to come by to taste some beer and purchase any product that is available on Belgiuminabox.com. We’re open from Monday to Friday from 10am till 6pm. Don’t hesitate to contact us if you want to anounce your visit! Author KurtPosted on September 9, 2015 Categories News, Other Belgiuminabox TopicsLeave a comment on The Belgiuminabox warehouse is now open to the public!